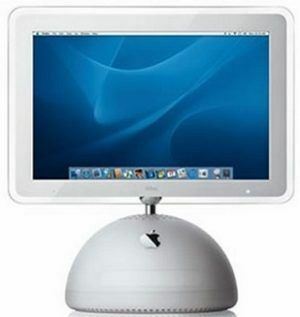 The iMac G4/1.25 20-inch “FP” has its hardware housed in a hemisphere about 10 inches high, while the 20” flat panel TFT monitor tops it on an adjustable steel arm. Due to the largest screen in the line-up the base hemisphere is made a bit heavier to counterbalance it. The iMac 4G “FP” with 20” monitor shares the hardware with the iMac G4/1.25 15” features a 1680 x 1050 TFT display, a 1.25 GHz PowerPC 7445 (G4) processor with the AltiVec “Velocity Engine” vector processing unit, 256 MB of RAM (PC133 SDRAM), an 80.0 GB Ultra ATA/66 hard drive (7200 RPM), a tray-loading 4X “SuperDrive”, and NVIDIA GeForce FX 5200 Ultra graphics with 64 MB of DDR SDRAM (AGP 4X support). The fanless cooling is replaced with an internal fan. The internal speakers are swapped for the external optional ones. The model was available with Apple Keyboard and Apple Mouse. Introduced on: November 18, 2003. Processor type: PowerPC “Apollo 6” G4 (7445). Video: 20″ TFT LCD, 1680 x 1050 pixels resolution, viewing angle: 120° horizontal and 90° degrees vertical. Graphics: nVidia GeForce FX 5200 Ultra with 64 MB of DDR SDRAM. Storage: 80 GB, 7200-rpm Ultra ATA-66 up to 128 GB Hard Drive Supported. Input\Output: 3x USB 2.0, 2x Firewire 400, built-in microphone, audio out, Apple Pro Speakers mini-jack, Mini-VGA video out. Internet \ Wireless connection: Optional 54 Mbit/s AirPort Extreme 802.11b/g, 10BASE-T/100BASE-TX Ethernet, 56k V.92 modem, Optional Bluetooth 1.1. OX: Preinstalled OS: 10.2.3. OS max. upgrade: 10.5.8. Dimensions: 13.03 x 16.7 x 10.6 inch maximum. Apple Model No: A1065 (EMC 1992). Users could make their own Hollywood-style DVDs using iDVD if their computer had a SuperDrive, you can create DVDs. Import and edit movies using iMovie. Then export to an iDVD movie file. In iDVD, choose a menu theme and drag your movies to the iDVD window. Customize your menus and buttons to look the way you want. Click the icon in the Dock to open Sherlock. Click the Internet icon and type a question in the search field. Click the Search button. Then double-click an item in the list of sites. iDisk: User’s own storage space on Apple’s Internet server. Users could share photos, movies, and other files over the Internet. Access their files from another Macintosh or PC. To store documents, pictures, movies and other files remotely: 1) Choose iDisk from the Go menu; 2) Drag files to a folder on your iDisk 1. to copy them. HomePage: Users could build a personal Web site in three easy steps.It was possible to create a photo album, publish an iMovie, post résumés, and more. iCards: This feature allowed the user to send an elegant iCard, just right for any occasion. Choose a ready-made photo, or create a personalized iCard using a photo on your iDisk. Email: Get your own Mac.com email address. It’s easy and works with your favorite email application. To use email, you must have an account with an Internet service provider. To check for new messages, click Get Mail. To view a message, click its subject. If you entered email information or got a Mac.com account when you first turned on your computer, Mail is already set up. To set up a new email account, choose Preferences from the Mail menu, then click Accounts: 1) Click the Mail icon in the Dock to open the Mail application. 2) To create a new email message, click Compose. 3) Type the email address and a subject. 4) Type your message and click Send. Click the icon in the Dock to open AppleWorks. Click the type of document you want to create, or click the Templates tab to modify a ready-made document. Use Software Update to get the latest updates and drivers. Click the icon in the Dock to open System Preferences. Then select the software you want to update. Choose Mac Help from the Help menu. Type a question referring to the computer issues. Click an item in the list of Help topics. In Mac Help, you can find a great deal of troubleshooting advice, including information to help you solve problems with connecting to the Internet, using software installation and restore discs, changing your computer’s settings, printing, and more: Click the Finder icon in the Dock, then choose Mac Help from the Help menu. Type a question in the search window (for example, type “How do I eject a disc?”) and click Ask. “SuperDrive” is an Apple trademark for their drives. The “SuperDrive” supports all formats of CDs and DVDs (DVD±R, DVD±R DL, DVD±RW, CD-R, and CD-RW). In spite of the moniker “Ultra” in the title, the nVidia GeForce FX 5200 Ultra video card is slower in performance than the GeForce 4th family cards. But then, iMacs were never about gaming. Asking yourself “where can I sell my old iPad?” – don’t look anymore, iGotOffer buys your old and used iDevices for the highest price online. Free instant quote, fast cash, free fully insured shipping: Sell used iMac for top cash.